Zelda the Gray returns. We see her napping in the studio beneath a Moog Mother-32, Subharmonicon, and sundry synthesizer modules. From skaterdays on Instagram. Studio session is closed for the night. The fuzzy assistant @zelda_the_greyneeds her beauty rest. 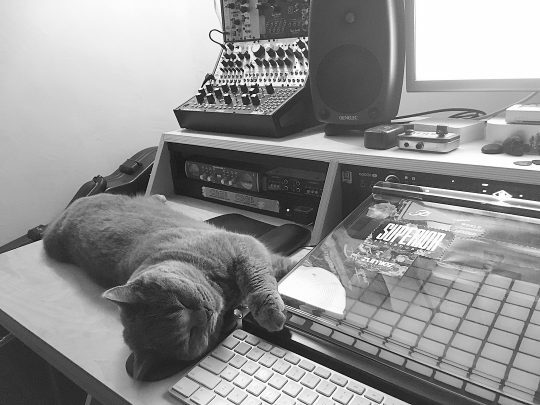 Posted on September 12, 2018 by catsynth	This entry was posted in Cats, Synthesizers and tagged analog, cat, modular, moog, russian blue, Synthesizers, zelda. Bookmark the permalink. The is one comfortable kitty! A musical one too – no limit to kitty talent.